Tens of thousands of fonts are available for the Macintosh. OS X Mavericks comes with hundreds of fonts. Some are pretty predictable, such as Times New Roman, but OS X gives you some artsy ones, too, such as Brush Script. If you really get into fonts, you can buy single fonts and font collections anywhere you can buy software. OS X actually has four Font folders. A third one, also called Fonts, is in the (hidden) Library folder in your Home directory. There are subtle distinctions among those three locations. The fourth one is in the Network/Library folder, and you see it only when you’re connected to a NetBoot network server. You can find many font formats with names like OpenType, Mac TrueType, Windows TrueType, PostScript Type 1, bitmap, and dfont. No problem — OS X supports them all. TrueType fonts: These standard-issue Apple fonts come with OS X. They’re in common use on Macs as well as on Windows machines. That’s partly because these fonts are scalable: They use only a single outline per font, and your Mac can make their characters bigger or smaller when you choose a font size in a program. Some Type 1 fonts come with two, three, or four printer fonts, which usually have related names. Just keep all the parts together, and they should work. OpenType fonts: OpenType fonts are really TrueType fonts in which PostScript information is embedded. This gives you the greater typographic control that high-end typesetters require while keeping the one-file convenience of TrueType. OpenType is one of the most popular file formats and the one favored by most major type vendors including Adobe and Linotype. Font Book lets you view your installed fonts, install new fonts, group your fonts into collections, and enable and disable installed fonts. As usual, you find the Font Book application in the Applications folder at root level on your hard disk. The easiest way to install a new font is to double-click it in the Finder. Font Book opens and displays the font. Click the Install Font button to install the font. Other ways you can install new fonts are to choose File→Add Fonts or press Command+O. A standard Open dialog allows you to select a font or fonts to be installed. Note that, by default, new fonts are installed in your Home folder’s Fonts folder, which is inside your invisible Library folder (Users/Home/Library/Fonts). You can change the default installation location in Font Book’s Preferences (Font Book→Preferences or Command+,). To view a font or font family, click its name in the Font list. Click the disclosure triangle before the name of a font to see all the variants that are installed. To change the size of the viewed font, click the triangle next to the font size in the top-right corner of the Font Book window and choose a new size from the drop-down list that appears, or type a different number where the number 18 appears, or move the size slider — the white dot and gray line that run along the right edge of the window — up or down. To disable a font so it no longer appears on any applications’ Font menus, choose Edit→Disable or click the Disable button (the check mark in a square button) at the bottom of the window. To enable a previously disabled font, choose Edit→Enable or click the Enable button (same as the Disable button). 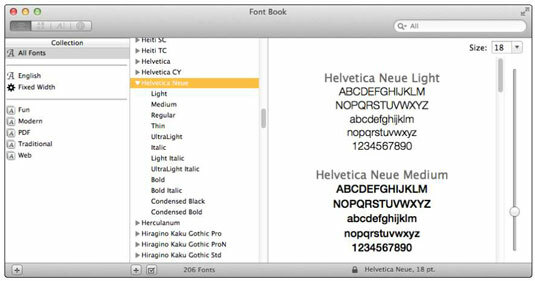 Mavericks’ Font Book looks out for your best interests; it won’t allow you to disable or delete any fonts required by Mavericks — including (but not limited to) Lucida Grande, Helvetica, and Helvetica Neue. To install a new font manually, drag its icon into one of the two Fonts folders that you have access to. Why might you want to install them manually? If you install a font via the double-click-and-use-Font Book method, the font will be installed in your Home/Library/Fonts folder, and available only to you. If you want other users to be able to access the new font, drag the font’s icon to the Fonts subfolder inside the Library folder, which is at the root level of your hard drive. This Fonts folder has universal access. Or, if you usually want to install fonts for everyone, change the Default Install Location in Font Book Preferences (Font Book→Preferences or Command+,). The Fonts folder in the Library inside the System folder is reserved for OS X and can’t be modified easily. If you try to remove a font from it — or add one, for that matter — you first have to authenticate yourself as an administrator. Do yourself a favor, and never remove fonts from /System/Library/Fonts. You can really screw up your Mavericks operating system if you remove the wrong font. So don’t go messing with the fonts in folders unless you know what you’re doing. Otherwise, just use Font Book, which prevents you from doing anything bad to fonts.